From modern style rooms, to rooms equipped with hot spring baths to Japanese Western fusion style rooms all of our rooms are designed for optimal comfort to accommodate the needs of any customer. Choose from Japanese, Japanese Western fusion or our premium rooms which include a traditional Japanese cypress wood bath. Our recently remodeled rooms are located on the 3rd and 4th floors, and have been especially designed and decorated to maximize comfort. Kick back on the sofa and enjoy the abundant nature of Okushiobara, and create precious memories together with the ones you love most. A delightfully aromatic wooden bath made of Japanese cypress is in each one of our premium rooms. Let the fatigue of your travels melt away in your own private hot spring. Each room is 25 square meters with a spacious veranda in addition to the bathroom which features your traditional Japanese bath and shower space. Elegant yet simple these rooms provide the perfect backdrop for a refined moment of relaxation. 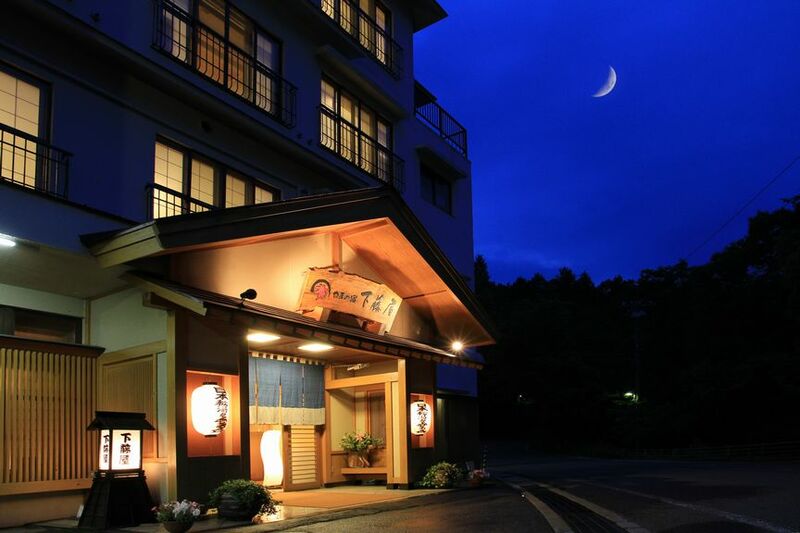 From Japanese rooms ranging from 13-19 square meters equipped with a bathroom, to Western/Japanese fusion rooms with twin beds and an adjoining 10 square meter Japanese room we have a variety of rooms to handle whatever your needs may be. Open you window and enjoy the plentiful natural beauty of Okushiobara. Relax, and enjoy a moment of tranquility. On top of towels and bath robes we offer a great selection of amenities that are popular with our female clientele in particular. In addition all rooms have a hair dryer. In your room: towels, bath robes, hair dryer, and amenity assortment. In the hot spring bathing area for ladies we offer facial toner, milky lotion, makeup remover, shampoo, conditioner, cotton swabs, hair clips, cotton pads, hair brushes etc. For men we have various lotions and tonics, and you will be provided with a disposable razor as well. Our lobby, where we’ll greet you and see you off, is adorned with Mingei style (folk art) furniture, and indirectly lit to create a soft and inviting atmosphere which will either start to or continue relieving the tiredness and stress of your travels. From handkerchiefs, and key chains to traditional shop curtains, uniquely designed dolls and folk art accessories our souvenir corner is full of original gift ideas. We also have snacks, Japanese sake and other locally produced food items. Why not buy something to remind you of your time here or share with your loved ones at home? We have a vending machine available on the second floor with various drinks including beer. If you plan on checking in after 18:00 please contact us in advance. If you plan on departing very late at night or very early in the morning please let us know in advance. We accept cash or debit card for payment. Though we do accept debit cards, in some situations certain debit cards may not work. With this in mind we ask you to bring cash along just in case (there is no ATM located within the vicinity of Shimofujiya). Please note we do not accept credit cards for payment. Day of: 100% cancelation fee. For groups of up to three people we can serve you your dinner in your room or in our dining hall. For groups over three people our dining halls have sliding walls so we can create a private dining space of whatever size suits your needs. Our course menu can vary due to the size of your group, season, price, as well as ingredient availability. Please enjoy the finest expression of each season in our recommended course. Please be aware that for those arriving late we may not be able to provide dinner. We have 30 free parking spaces available. Space is at a premium however so we ask that you be considerate of space when parking. Kawase Hasui (1883-1957) was a prominent modern Japanese woodblock (ukiyoe) artist. Along with the likes Ito Shinsui and others he was part of new wave of woodblock art known as shin-hanga during the Showa and Taisho Eras. 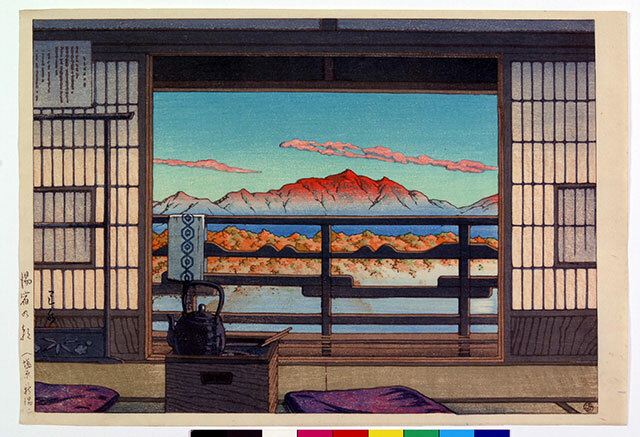 His woodblock prints depict nostalgic scenes of travel around Japan combined with scenic beauty. In the shin-hanga world he is mentioned in the same breath as other legends such as Katsushika Hokusai, and Utagawa Hiroshige. Natural themes such as snow, the moon, flowers and rain impart a deep emotional feeling in his works which is part of their appeal and a reason why they are very highly regarded outside of Japan as well. The two prints displayed above are Yuyado no Asa made in 1946 and one of his earlier works Shinyu no Aki made in 1918. Both works depict his time at Shimofujiya. Take a stroll in the halls of Shimofujiya and you’ll see a print of Yuyado no Asa. And also have a look in the lobby for a picture of the original Shimofujiya building. It’s from the 3rd floor of this building where Yuyado no Asa was inspired. In the Meiji Period (1867-1912) travel to Shimofujiya was by no means easy as access by foot and by horse were the only ways to get here. One customer who had a particular affinity for Shimofujiya was none other than Yamaoka Tesshu who history remembers as a hero of the Bakumatsu Period (1853-1867) and the driving force behind the bloodless surrender of Edo Castle to imperial forces which effectively started the Meiji Restoration. A visitor to Shimofujiya several times over during his work as a prefectural councilor in Ibaraki Prefecture, he was a fond admirer of our hot springs. Primarily heralded as a vassal to the shogunate, a politician, a thinker, a swordsman, and a writer. 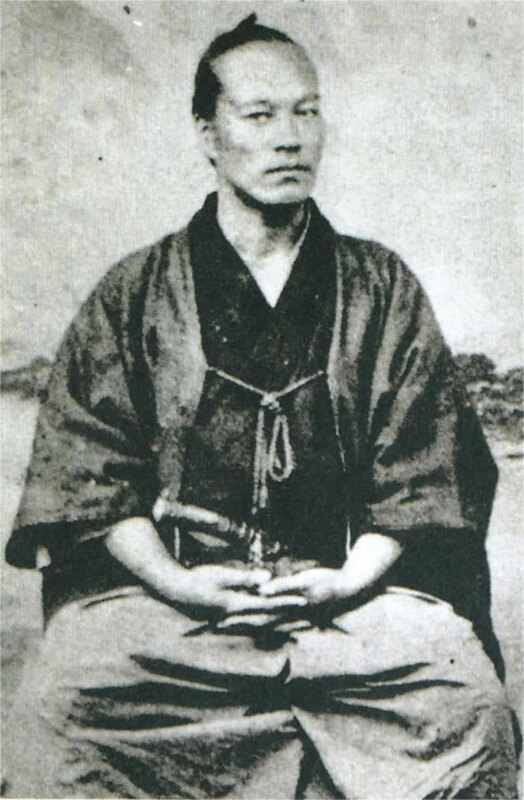 He was also known as a master of Zen art, and along with his name Yamaoka Tesshu, he wrote under the penname Ichiraku Hitoshi, and was commonly known as Testutaro, and was one of the famous three with the character shu in his name during the Bakumatsu Period. Later in his life he served as a private teacher to the Meiji Emperor, and enjoyed an extremely high status in society. In 1875, now a chamberlain to the Meiji Emperor, while traveling with the last shogun’s brother Tokugawa Akitake to his estate it was decided that they would accompany the Meiji Emperor to view cherry blossoms. As at the time Japan had opened its borders to the world, accepting and incorporating Western ideas into Japanese society was en vogue, and Yamaoka struck upon the idea to pair Western bread with a beloved Japanese sweet (sweet red bean paste). The snack became known as anpan, symbolic of having a Japanese spirit mixed Western learning and, when using his role as chamberlain, Yamaoka presented it to the Meiji Emperor, the Emperor became instantly infatuated with it. From then on the Meiji Emperor was regularly presented with anpan. Even to this day anpan is a Japanese snack staple, and every April 4th is known as anpan day just as the Meiji Emperor decided over 100 years ago. Have a peek in the main dining room adjacent to the lobby to see two original hanging scrolls made by Yamaoka Tesshu himself.